Heading into Texas Motor Speedway’s Longhorn 350 first in points and with a second place finish there in 2018, things looked good for Stewart Friesen in 2019. He had even captured the pole last year in Texas, and had again just the week before in Martinsville. 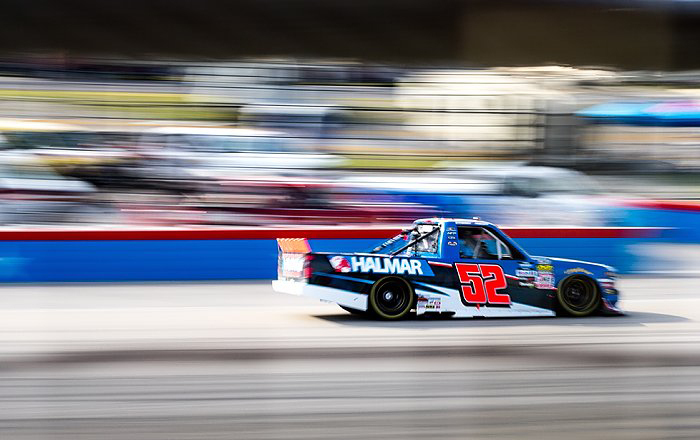 All things considered, Texas was among Halmar-Friesen Racing’s best shots at a truck series win. Friesen has extended his lead of the points standings to six points over second place after picking up an additional 49 series points at Texas. Despite the HFR team’s hunger for a win, their strategy of consistency is paying off so far, but a win would guarantee Friesen a spot in the playoffs. With a break in the NGOTS till May, Friesen plans to get back to Dirt Racing in the Northeast, where he’s already off to a winning season. Sunday, April 7th, Friesen will hit Middletown NY’s Orange County Fair Speedway for the kick-off to their 100th season of racing. This is a track near and dear to Friesen as it is the home track to many of his Halmar Racing teammates and is a track he often performs well at. In 2018, Friesen captured a win at the Eastern States 200, Northeast Dirt Racing’s oldest Championship weekend.